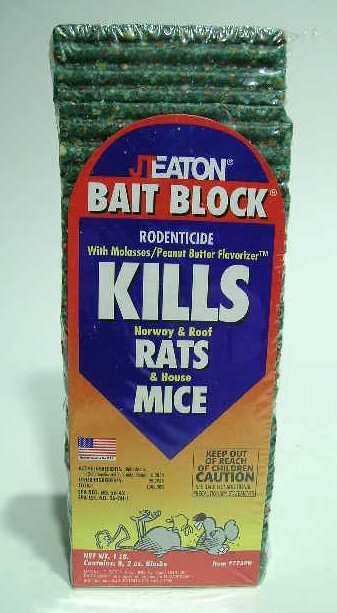 PRODUCT DESCRIPTION: JT EATON™ PEANUT BUTTER BAIT BLOCK® Rodenticide. Pafaffinized design resists moisture and extends bait efficacy. This is a very slow acting bait. Rodents will begin dying 7-10 days after initial feeding. WHERE TO USE IT: Best used inside Tamper Proof Bait Stations. Place in areas where rodent populations are suspected. 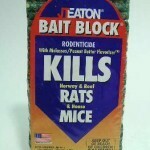 RATE OF APPLICATION: Placements should be no more that every 15 feet for rats and even closer for mice.